Dr. Richard J. Stuart Blog: What if My Product Isn't ADA-Approved? The American Dentistry Association seal of approval is awarded to consumer oral hygiene products that meet ADA-defined standards. The seal is intended to help consumers make informed choices about the products they use. Products that are ADA-approved have undergone extensive testing for safety and efficacy, to ensure that any claims made about them are factually correct. Companies that submit products for assessment have to submit ingredient lists and data from laboratory studies and clinical trials that support the product claims, and show that the product is being made using good manufacturing practices. Each product is assessed by around 100 consultants, from a variety of scientific disciplines relevant to oral health and hygiene. 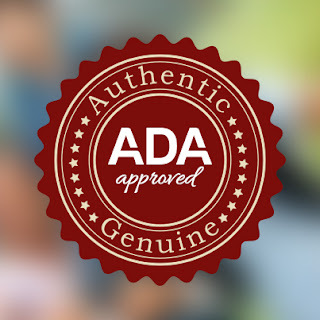 Once a product has been approved, the packaging is required to display the ADA seal. So is it okay to use products that are not ADA-approved? If a product hasn't been approved, that doesn't automatically mean it's unsafe or ineffective—but using ADA-approved products takes the guesswork out of choosing and using effective products. For example, if an ADA-approved toothpaste claims to be effective at preventing tooth decay, the presence of the seal means you can be sure it's a valid claim. Many Crest, Aim, Listerine and Tom products are ADA approved, just to name a few.